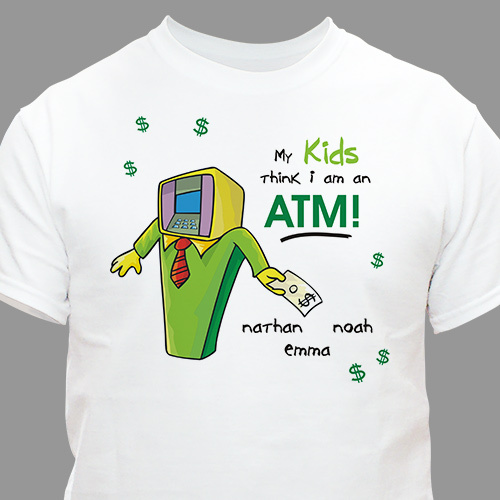 You are not the bank but if your kids sure think you are, check out our Personalized ATM Dad T-Shirt. Your Personalized T-shirt for Dad is available on our premium white 100% cotton Personalized T-Shirt, machine washable in adult sizes S-3XL. Also available in Ash Gray. Includes FREE Personalization! Personalize your ATM Dad T-Shirt with any title and up to 30 names. Check out our entire collection of Personalized Father's Day Keepsakes they're great for gifts for Dad. Create an Engraved Keepsake Photo Frame for Dad, Grandpa, Brother or Uncle today.